An indoor exercise bike is a convenient piece of exercise equipment that can add a lot of convenience to your life. Instead of heading outdoors and braving all kinds of weather, you can set up a stationary cycle in your home, then watch TV while you work out! You get to enjoy differing resistance – as if you were experiencing various terrain – but without leaving your house. It doesn’t get much better than that. Unfortunately, not every indoor exercise bike on the market is the same. Many differ in features, adjustability, and quality. As a rule of thumb, the larger the sum you pay, the higher quality the bike, but that’s not true in all cases. As a result, you may like to take a look at these options below and see if any indoor exercise bike could suit your requirements. When you’re on a budget, but you want to get fit, this indoor exercise bike from MaxKare could put you on the right track. Even though it doesn’t cost the earth to buy and maintain, it helps you keep fit and healthy going forward. 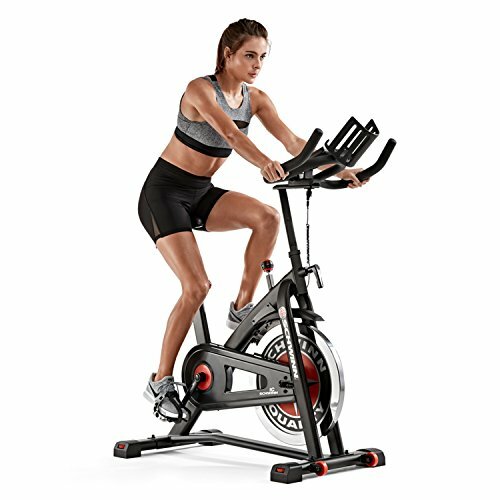 This indoor exercise bike comes with a 44-pound flywheel, uses a belt-driven mechanism, and offers non-polar resistance adjustment to make the entire exercising experience straightforward. It works with your body to provide a workout that works for you. However, that’s not all that’s impressive. Not every indoor exercise bike on the market is adjustable, but everyone is different. MaxKare bucks the trend by ensuring not only the seat is easy to adjust, but the handlebars are as well. It will even support those weighing up to 260 pounds. The seat, while padded, is a wee bit uncomfortable, and the assembly part can be a challenge. But, overall, this indoor exercise bike is one that could be worth a closer look – it has all you need in an expensive model but without the over-the-top price tag. 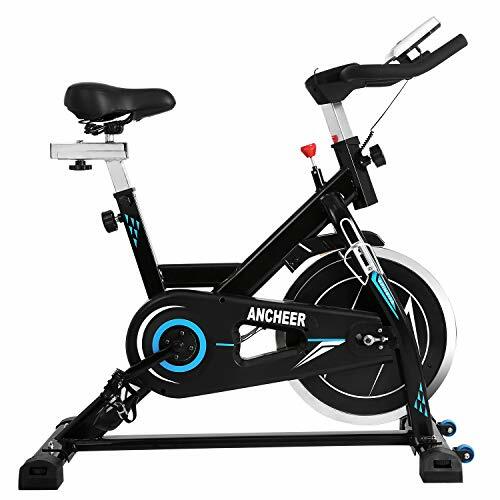 If you’re new to the world of exercise equipment, then there’s every reason to start with this indoor exercise bike from ANCHEER. While it’s not a high-end bike by any stretch of the imagination, the quality and features will surprise you. What’s more, it’s not a significant investment when you choose to buy one. You can select from silver, black, or yellow for a color scheme, then get to work right away assembling it. This process will not take long at all. You can then benefit from the belt-driven style for maintenance conveniences, as well as the quiet 49-pound inertia flywheel and quick-stop braking system. 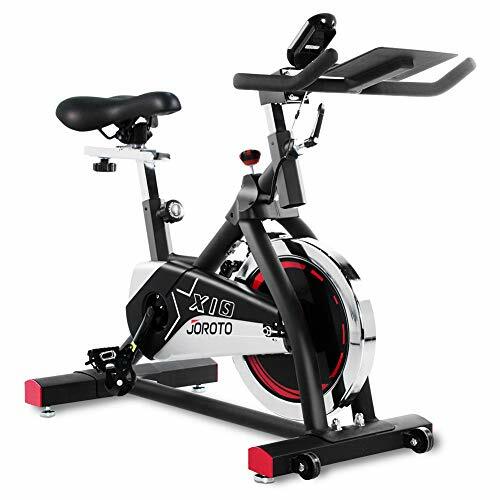 If you partake in cycling and want a new training regime, this indoor exercise bike can mimic any riding style to suit. You can feel like you’re out on a trail with no problems at all. Once you’re on it, too, you can adjust the tension, pedals, and handles to suit your needs. Even the padded seat had adjustment options, but it does not go back further enough for taller riders. This entire unit is suitable for any cyclist, and there are only a couple of points that may deter you. The plastic monitor is cheap, and when you use resistance, the indoor exercise bike can squeak. Overall, it’s a reliable machine that’s going to impress. If you want to mimic the racing position as you get valuable training in at home, then this indoor exercise bike could be the best bike for you. Even though it’s like most other indoor exercise bikes with regards to the features, the posture of it tends to lean toward professional cyclists. If that’s you, you’re in for a treat. There’s a bargain to be had when you choose to purchase this indoor exercise bike. It is a belt-driven bike, comes with a neat white color scheme, and operates with a 22-pound quiet flywheel. If that’s not enough to convince you to open your wallet, then the inclusion of the steel frame, adjustable resistance knob, and the comfortable seat will be. If you need to measure where you’re at, then this indoor exercise bike can help here too. Your heart rate and every other vital piece of information are available on the LCD monitor. You can also rest assured it is sturdy and built to last thanks to its 280-pound weight capacity. Adjust the seat, leveler, and handlebars, and get your new training regime on this indoor exercise bike underway today. Even though this indoor exercise bike from Sunny Health & Fitness has a few flaws, once you know what they are and can set about fixing them, you may be happy to own this bike. Even looking at it will make you realize it has many positive points that you may not be able to say no to. As a professional-style indoor exercise bike, it’s going to be beneficial for helping you train for cycling events. It will mimic an on-road cycle as much as it can. It also has a heavy-duty frame, generous 275-pound weight capacity, and a sleek style to seal the deal. When it comes to adjustments, this indoor exercise bike will deliver. You can adjust the resistance, seat, and handlebars, but the handlebars will not fit horizontally – something to keep in mind. The pedals are a caged style to be more realistic, and it comes with transport wheels to move anywhere around your home or gym. Finally, when you use it, it works quietly and smoothly, but it might need a tune-up once you assemble it. It’s clear to see there is work to do once you get this indoor exercise bike, but it has plenty of potential to be one of the best on the market. 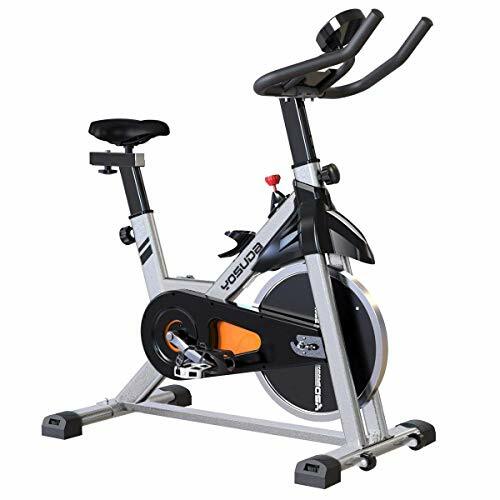 There will be a “wearing in” period with this indoor exercise bike, with many of your adjustments needing tinkering over time, but once you get everything in order, you will love everything about this cycle from Akonza. You can choose from six beautiful color schemes, then set it up with minimal effort in your living room or home gym. Its small frame size means you will have no problem fitting it in your home, while the transport wheels mean it’s effortless to move it again too! What you will also like about this indoor exercise bike is the digital monitor. Instead of cycling blindly with no idea how you are faring, this cycle lets you know every part of your exercise session. There is a range of monitors to suit your needs. For comfort, this indoor exercise bike goes above and beyond. Both the handlebars and seat are padded and adjustable, while there is also a water bottle holder for quick access as you work out. While not everyone finds the seat all that comfortable, and the plastic parts are not all that durable, the majority of people will believe this indoor exercise bike to be one of the best on the market. If a regular indoor exercise bike is not your cup of tea, then it might be time to take a look at this unit from FLEXISPOT. Have you ever complained about never having enough time to exercise because you have so much work to do? This indoor exercise bike solves that problem. As you pedal away, you can have your laptop sitting on the attached desktop – enabling you to get that important work done. It doesn’t get much better than that. This indoor exercise bike is a bit more expensive than most, but it also has more convenient features. You can buy it in black or white to suit your home or gym’s style, and you can also buy it with or without the desktop components. It also has transport wheels so you can move it where you need it to be. However, these wheels don’t run all that smoothly. If you find that your first time on this indoor exercise bike is not all that comfortable, then don’t worry. All settings are entirely adjustable to suit your needs. You can adjust the height of the desk and the seat while choosing from eight resistance levels to get you sweating. 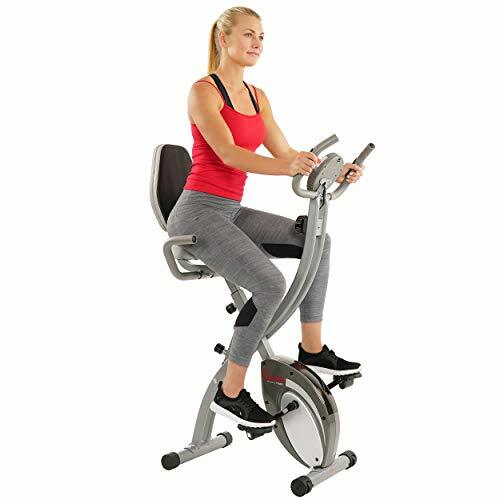 This indoor exercise bike is expensive, can make unusual noises and is not always overly comfortable, but for multi-tasking, it ticks all the boxes. Customization is essential when it comes to an indoor exercise bike. After all, you want to be comfortable while you’re getting fit at the same time. Fortunately, this JOROTO model allows just that. Not only can you adjust the resistance, handlebars, and seat, but you can also change the seat. If you find it’s not comfortable, you can select a wide or narrow one to suit your needs. There is also plenty more to love about this indoor exercise bike. It comes with a parts warranty for one year if you have any problems, and it suits people up to 280 pounds in weight. It also has an AV frame, a 35-pound flywheel, and a straightforward assembly process. If you want to track your progress, this indoor exercise bike lets you do that too. Its digital monitor keeps track of everything you need. The seats aren’t all that comfortable, and it’s noisier than other indoor exercise bikes on the market, but this bike is still a valid option that could be worth a closer look. Not everyone has space for a large, cumbersome indoor exercise bike, but that tends to be all that’s available for sale. Fortunately, Harvil has come to the rescue with this stationary bike that’s bound to impress. Not only is it lightweight, small, and compact, but it folds up too. Therefore, you can use it in any area of your home, and it won’t impose on your space. If guests arrive, you can fold it flat and slip it into a closet or behind a door. You can also buy it in aqua, peach, or black to suit your home décor, then benefit from its overall style and flair. This indoor exercise bike is unlike any other on the market so it will get heads turning. You can adjust the resistance level to any of ten, then enjoy the magnetic resistance, anti-slip pedals, and digital monitor. This digital monitor is exceptionally detailed and includes pulse rate sensors as well. Even though it’s not the sturdiest indoor exercise bike on the market, it doesn’t lose any points. It’s a nimble bike that’s going to make many people with a lack of space very happy. As most people know, gym memberships can be expensive, so why not get fit with this indoor exercise bike in the comfort and privacy of your home? As one of the most affordable indoor bikes on the market, it’s sure to grab your attention. What’s more, even though it’s affordable, you don’t have to sacrifice on quality. This indoor exercise bike ticks all the boxes. Firstly, it features robust and stable 14-gauge steel frame with powder coating. You won’t have any problems with rust or durability. It also has a seat you can adjust, counter-balanced pedals, and a display with a lot of different monitoring options. 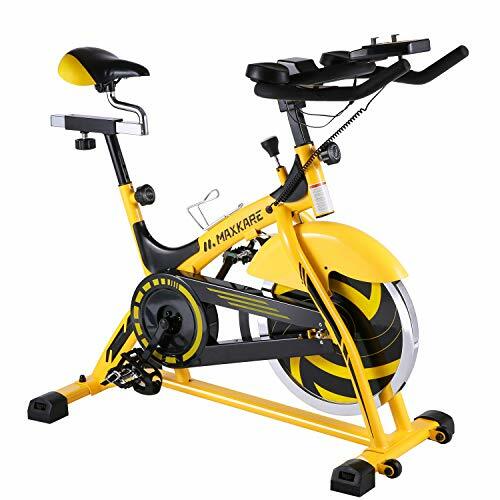 If you like customization, this indoor exercise bike covers you here too. You can adjust the magnetic resistance system to one of eight difficulty levels. Put your feet in the adjustable pedal straps, sit on the comfortable seat, and get to work! Of course, with such a low price tag, there are going to be a few disappointing features. You only get to choose from one color, the monitor features cheap plastic, and the seat can work its way loose. The tension settings and pedals are also not as good as other models. All in all, however, these are only a few points and should not draw away from the positives of owning this indoor exercise bike. For many people, buying an indoor exercise bike can be a considerable investment. Not everyone has a few hundred dollars lying around. What’s more, if you spend that money, you are not guaranteed to get the indoor exercise bike you wanted or that worked the best for you. If you take note of these points below, however, you are more likely to get the best bang for your buck when you finally hit that buy now button. If you want to narrow down the indoor exercise bike market to a few options, then one of the most effective ways to do that is with the size and weight capacity. Firstly, think about the space you have available. 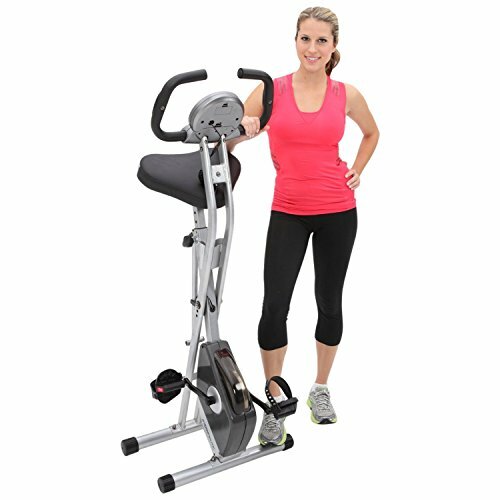 Do you need a large or small indoor exercise bike? Cull out a few options accordingly. Then, consider your weight. You may need a bike that caters to larger people, or any capacity might suit you as well. If you are buying an indoor exercise bike with a flywheel, it can be hit or miss with the noise. You will experience a whirring sound every time you pedal and work up momentum, but some bikes are noisier than others. Read comments and reviews on products to find out if noise is a problem. You don’t want to annoy your family while they’re watching TV! 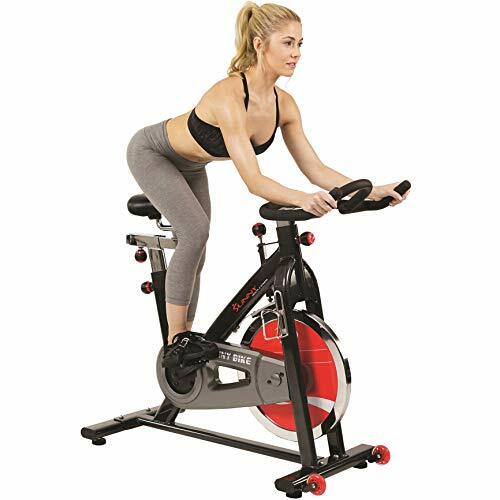 Every indoor exercise bike is different, which is why you need to put a lot of thought into buying one online. Find out what you can and can’t adjust, and whether the seat is comfortable. At a minimum, you should be able to change the handlebars and seat – and both should have padding.